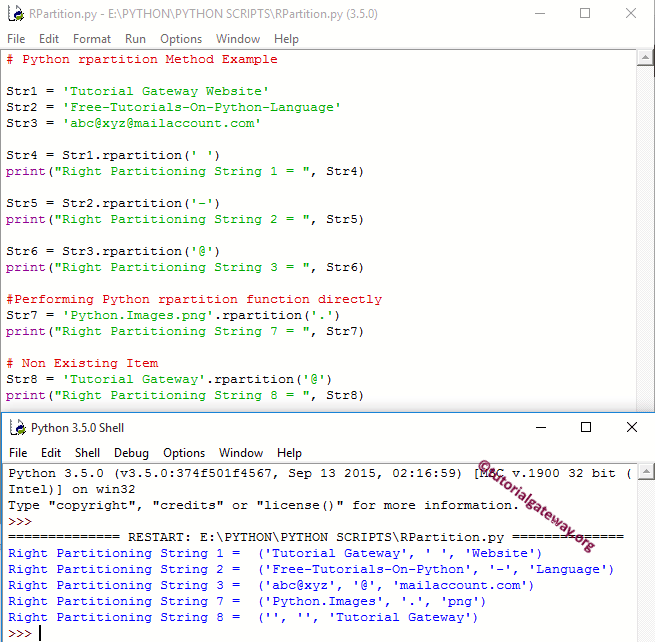 Python RPartition is one of the Python String Method which is used to partition the given string using the specified separator and return a tuple with three arguments. This function will start looking for the separator from Right Hand side and once it finds the separator, it will return the string before the Separator as Tuple Item 1, Separator itself as Tuple Item 2 and string after the Separator (or remaining string) as Tuple Item 3. In this article we will show you, How to write rpartition in Python Programming with example. TIP: Please refer Python Partition article to understand the Partition method, which performs the same operation but from left to right. NOTE: If you pass the non existing item as the separator then rpartition will return two empty strings as Tuple Item 1, Item 2 followed by the whole string as Tuple Item 3. TIP: Even though there are multiple occurrences of the separator, rpartition function will look for the first occurrence from the right side. The following set of examples will help you understand the rpartition Function in Python Programming Language. Following statement will partition the Str2 string into multiple parts based on the ‘-‘ symbol and prints the output. Following statement will partition the Str3 string into multiple parts based on the ‘@’ symbol and prints the output.